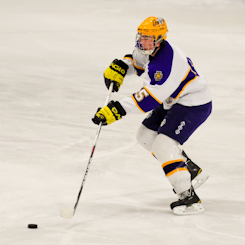 After splitting the regular season matchups, Cretin-Derham Hall won the rubber match in the Section 3AA quarterfinals over East Ridge, 4-1, on Thursday, Feb. 24. In the combined three games between the two teams, the Raiders have scored 13 goals against the Raptors. Five of them have been by senior forward Bob Kinne – and three of those five goals came during the Feb. 24, playoff matchup. Kinne knew how important it was to find the net early in the game. The co-captain notched his second hat trick of the year advancing the No. 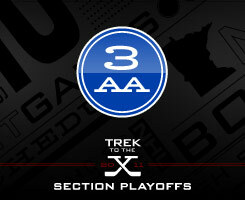 3 Raiders in the Section 3AA playoffs. Already up 1-0, the Raiders found themselves on the penalty kill in the final minutes of the first period. A shorthanded goal with 1:11 in the period by Kinne would end up standing as the game winner. 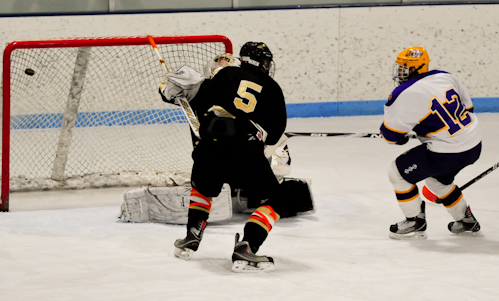 Six different Cretin-Derham Hall skaters registered an assist during the game with five of those assists coming on Kinne’s goals. Up next for the Raiders is a tough semifinal matchup against the No. 2 seed – Apple Valley. “We’re feeling good,” O’Neill said. “We’re excited about the challenge of moving on. We’ve played well the last six weeks so we’re feeling good. Next one is going to be big, I’m sure we’ll be the underdog but hopefully we’re up to it. A game plan that the Raiders are ready to run with. “It’s going to be a tough battle we just have to lock down defense on them, play hard and score on our chances,” Kinne said. The semifinal game between No. 3 Cretin-Derham Hall and No. 2 Apple Valley will take place on Saturday, Feb. 24, at 8 p.m. at the State Fairgrounds Coliseum in St. Paul. Despite East Ridge being the No. 6 seed in Section 3AA, No. 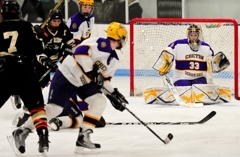 3 seed Cretin-Derham Hall knew it would not be an easy game. The quarterfinal matchup was closer that the final score suggested. “(East Ridge) is well-disciplined,” O’Neill said. “They did a good job in their end. They didn’t give up a whole lot secondary shots, we’d get our one shot and that was about it. They played well in front of (Andrew McDonough) and he’s a good goaltender. 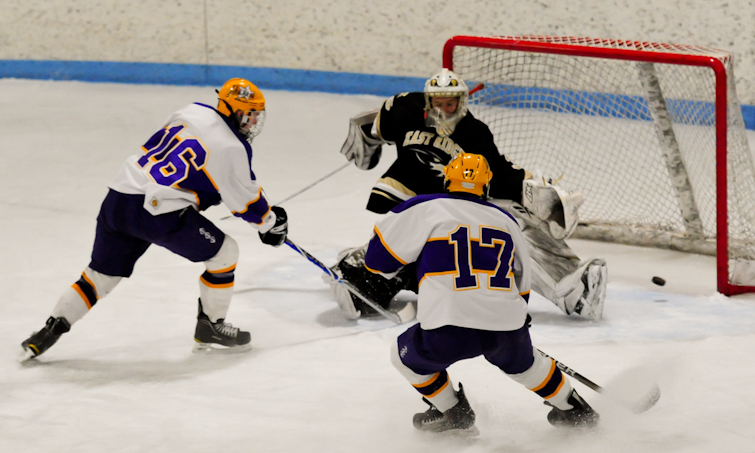 Cretin-Derham Hall came out of the game on top to win the tiebreaker and advance in the Section 3AA playoffs. 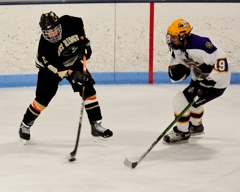 East Ridge ended its second varsity season with a 10-16-0 overall record and skated hard until the very end. Along with those tough breaks, Long gave credit to the talented Cretin-Derham Hall squad. “Guys like (Bob) Kinne and (Tony) Barbato and the O’Brien’s and (Tyller Robert) that big defenseman out there – that’s a tough group to play against,” Long said. 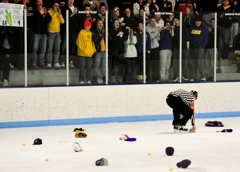 All of the regular pregame festivities took place prior to the Thursday, Feb. 24, Section 3AA quarterfinal game between Cretin-Derham Hall and East Ridge. Warmups, announcement of the starting lineups and playing of the national anthem. As the anthem ended, Cretin-Derham Hall huddled around their goaltender for some last minute motivational words. However there was a different scene on the opposite end of the arena. East Ridge players took a knee in the far corner of the rink and held a moment of silence and prayer to honor Ann Haering – an East Ridge senior who passed away on Sunday, Feb. 20, after a four-year battle with cancer. “We were proud of the fact that they battled hard this week,” East Ridge coach Doug Long said about his team’s effort. “They lost (Haering) to cancer earlier in the week and they were dealing with that, yet they still had a crystal clear throughout practice. 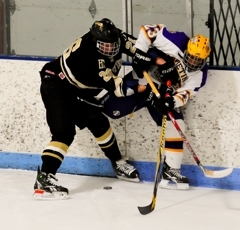 Despite the 4-1 final outcome, East Ridge played a physical game that had both teams skating hard until the final whistle. “Our kids have battled some adversity and they had a great game plan that they put in to place,” Long said. Along with the already heavy hearts East Ridge played with, the loss was difficult to bear for both players and coaches. “There’s two parts of the season that you don’t really like – it’s that day that you make cuts at the beginning and then when you have to address your kids after they lose their playoff game,” Long said. Still, positivity and determination are on the horizon for the Raptors. “Our program, being two years old, there’s been growth each and every year,” Long said. “The kids have learned a lot this year in terms of how to play as a team and how to play the game so that you give yourself the best chance of winning. Maybe that doesn’t always mean putting pucks in the net but maybe keeping pucks out of our net. Unfortunately we’re going to graduate nine seniors – this is our first senior class which makes that even harder tonight – a group of kids that played their last high school hockey game. To read an article from the Woodbury Bulletin about Ann Haering, click here. Senior forward Bob Kinne scored a hat trick and six different Raiders registered an assist during No. 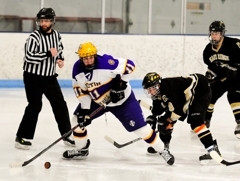 3 Cretin-Derham Hall's 4-1 victory in a Section 3AA quarterfinal game against No. 6 East Ridge on Thursday, Feb. 24. 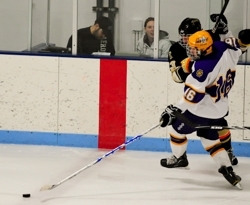 Rob Donovan scored the additional goal for Cretin-Derham Hall that came seconds after an East Ridge goal was waved off on a high-sticking call. East Ridge senior forward Kelvin Walz scored the Raptors' only goal of the game on a power-play opportunity. Scoring chances were hard to come by in the physical game with only 31 total shots on goal. 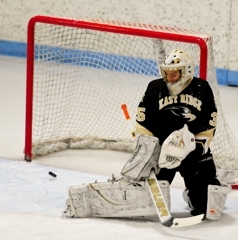 East Ridge goaltender Andrew McDonough made 18 saves as the Raptors finished the season with a 10-16-0 record. 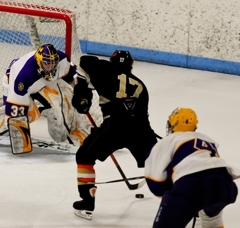 Cretin-Derham Hall goaltender Joe Schneider made nine saves for the win. 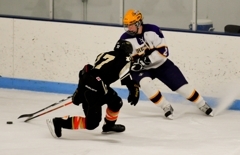 Up next for the Raiders (14-8-4) is a Section 3AA semifinal matchup on Saturday, Feb. 26, against No. 2 seed Apple Valley at 8 p.m. at the State Fairgrounds Coliseum in St. Paul. The senior forward came into the game with 49 points (19 goals, 30 assists) in the regular season. 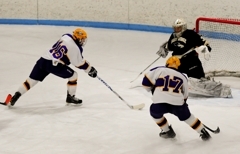 The Raiders' leading scorer started out the 2011 postseason with a bang registering his second hat trick of the season. Kinne scored twice - once early and once late - in the first period. His second goal came on a shorthanded chance that ended up being the game-winner and set the tone for the remainder of the game. Along with excellent play at both ends of the ice, Robert provided an assist on Kinne's hat trick goal. The senior defense sent several hard shots on East Ridge goaltender Andrew McDonough and did a good job shutting down any scoring chances for the Raptors. With his dad, Wes Walz, as well as former Minnesota Wild great - and current East Ridge assistant coach - looking on, Kelvin punched in a second period power play that brought the Raptors within one of Cretin-Derham Hall at the time. The senior forward had a couple good scoring chances and his presence was felt in the defensive zone as well. The Star Tribune's top performers, No. 75 through 51, when it mattered most.